and will be updated as more information becomes available. that will still have to be integrated in the exophenotypology. Exophenotypology is a new interdisciplinary research field. It came into existence to accommodate the need for a classification of the various UFO occupants and extraterrestrials that people have encountered. Contrary to popular belief, exobiology does not, at present, study the different species of aliens that people (claim to) have encountered. Indeed, exobiology is “an interdisciplinary field, combining aspects of astronomy, biology and geology, which is focused primarily on the study of the origin, distribution and evolution of life.” (“Exobiology,” Wikipedia). A new word should therefore be created for the discipline that does describe these different species. At present, the main criterion we have to classify these species is their physical appearance, as given by eyewitnesses. Exophenotypology could thus be described as the typology or classification of extraterrestrials based upon the observable characteristics of their physical appearance. Patrick Huyghe and Dennis Stacy probably were probably the first to make a systematic classification based upon phenotypes, i.e. the observable characteristics, of aliens. (Patrick Huyghe and Dennis Stacy, The Field Guide to Extraterrestrials: A Complete Overview of Alien Life Forms Based on Actual Accounts and Sightings, 1996. However, see also: Terence Dickinson and Adolf Schaller, Extraterrestrials: A Field Guide for Earthlings, 1994). 1. First of all, it should be pointed out that this classification is only meant as a temporary one. Since it is largely based on existing biological categories on Earth it is likely to be inadequate in the long run. Furthermore, the existing biological categories are not strictly applied, since we are going by "appearance." We have opted for a pragmatic approach in this regard, based on these "appearances" and on similarities to what we know. Still, because of the resemblance to reptiles, people have started referring to these beings as 'reptilian.' It is exactly because of this pre-existing terminology in the literature and on the Internet that we have chosen the above mentioned pragmatic approach. That doesn't change the fact that in all likelihood the classifications used here may in the long run be proven inadequate and biologically incorrect. 2. A second limitation that has to be taken into account involves the considerable differen­ces in reliability of the sources that provide the available data set. Information about physical appearance may be the result of firsthand observation by witnesses, or it may on the other ex­treme be provided as second hand information that was channelled on top of it. (Take, e.g., the cases where the channel receives information on other species from its source, where that source does not belong to the species mentioned). Adding yet another layer of complexity to this all, is that experiencers may have implanted memories or screen memories that are different from what happened in reality. In other words, their observations may be tainted. 3. A third limitation is of a linguistic / semantic nature. The vocabulary and language that we have at our disposal often turn out to be inadequate as well. The term "olive skinned," e.g., has been used to describe beings that look Mediterranean, as well as for beings that have a skin colour that is olive-green, and who have yellow or orange cat-like eyes. Whereas the former would appear perfectly human and indistinguishable from Earth humans, it is obvious that a green-skinned being with yellow or orange cat-like eyes would stand out. Yet, both have been referred to as "olive-skinned." So on the one hand, we have cases where the same term has been used to describe beings that actually do belong in different categories. On the other hand, as this example just showed, we have cases where different terms have been used ('Mediterranean' and 'olive-skinned') to describe beings that look alike or could be the same. So these, too, are observations that have to be taken into consideration, and that may lead to incorrect classifications where it isn't clear what was actually meant. For convenience sake, at least for the time being, Greys are listed as a separate group. Let’s have a look at all of these in (slightly more) detail. The first category, humanoid, consists of extraterrestrials with an appearance that looks human. Four subcategories can be discerned. Also referred to as Blondes, Scandinavians or Swedes, the Nordics have Caucasian features, usually with blond hair and blue eyes, though other hair colours and eye colours have been encountered as well. They can be anywhere between 5 to 7 foot tall. Nordics have been encountered all over the world, in close encounters of the third and fourth kind. Native cultures all over the world, too, have stories about Scandinavian looking extraterrestrial visitors. Quite often, too, extraterrestrials are encountered in CE3 and CE4 experiences that are 'Mediterranean' or 'Latin' looking. They typically have a tan, and black hair. Apart from Scandinavian and Mediterranean looking extraterrestrials, virtually all kinds of other human looking aliens have been encountered. But they are outnumbered by the first two categories. A second subcategory of terrestrial looking aliens is shorter in size than the majority of terrestrial humans. Santini is an Italian name –meaning little saints – for extraterrestrials that look just like us but are shorter in stature, i.e. they are between 0.9 to 1.2m (3-4ft) tall. The ratio of the lengths of their torso, head, and limbs is comparable to that of standard humans. Santini have been encountered all over the world, though more frequently in Europe and Latin America. A second subcategory of shorter terrestrial looking extraterrestrials consists of ‘dwarfs,’ i.e. they have a short stature and disproportionately short arms and legs. Dwarfs, too, are encountered all over the world, though they seem to be more prevalent in Europe, and even more so in the UK. One variety of extraterrestrial dwarfs that has been encountered on several occasions is the ‘hairy dwarf,’ who typically is not wearing any clothing, but seems to be covered with hair all over. There are stories about shorter humanoids that have slightly bigger heads and bigger eyes, which are said to be ‘bulging.’ They measure about 0.9 to 1.2 m (3 to 4 feet). They have a fair complexion, with pale white skin that is sometimes referred to as ‘ashen white.’ They have a proportionally large, bald, non-bulbous head, a very small nose, tiny lipless mouth, a face with a high forehead that is wide at eye level but thins at the chin. People say they have a childlike quality about them, yet they have been encountered during abductions! The shape of their heads and of their bodies is different from that of small Greys. [The body] was expectedly short, (...) and solidly constructed for their gravity, which is 3.2 times that of Earth. The eyes were about the same size ratio to the head as ours, and placed at about the same location on the face. They were deep blue, almost indigo, with smaller pupils because of Korena's light being about 1/6 brighter at the Korendian surface than our sun's on Earth. There were no discernible eyebrows (or in fact any hair at all). The skull structure over the eyes protruded more than a Terran's, perhaps to shade the eyes from overhead sunlight. The ears were smaller in relation to the head than ours, lobeless and distinctly peaked at the top. They were pressed almost flat against the head. The nose was small, with slit nostrils. The mouth was slit-like, with lips that were less pronounced than ours, and slightly narrower in proportion to the jaw. It was curled upward in what on Korendor must pass for a smile. The head was rounded, with a larger cranial cavity (comparatively) than a Terran's, and with concavity in the cheeks that started at the lower jaw and ended in front of the ears. The neck was thick and sinewy, again an effect of higher gravity. The torso was compact and powerfully muscular. The arms and legs were at about the same ratio of length to body height as ours, but were heavier and very well developed. The hands were proportionate to ours, but with slightly longer fingers and a discernable webbing between the thumb and the rest of the hand. As with the rest of the body, it appeared to be quite strong. The skin was very smooth. It was what we would call "white" in color, but with a "tanned" appearance not unlike what one would see on any California beach. A third subcategory of extraterrestrials that looks terrestrial in appearance is taller than the average human being. Tall Whites look almost human though they have a thin frail body build, chalk white skin, large blue eyes, and nearly transparent platinum blonde hair. Their eyes are perhaps twice the size of human eyes and they stretch noticeably further around the sides of their heads than standard human eyes do. They usually measure between 6 to 9 feet / 1.8 to 2.7 meter. Two main types of giants have been encountered on several occasions, others sporadically. The first type looks exactly like us, but they are taller. They typically are between 6 to 9 feet tall, generally athletically built, and Caucasian in appearance. These have been referred to as Lyran Giants and as Anunnaki in the literature. The second type is thin, with longer limbs, larger skulls and bigger eyes. Also, when they walk it is with a rocking gait. A fourth subcategory consists of beings that in many ways look human, like us, yet have one or more features that clearly distinguish them from 'normal' humans. These individuals are Oriental looking with (green) olive-coloured skin and slanted eyes. Some eyewitnesses mention cat-like eyes. They have been encountered all over the world, and quite often in the presence of unmarked dark helicopters. (Some authors speculate that they may be indigenous to Earth). Note: some authors use the term olive-skinned for normal looking tanned extraterrestrials. Those belong to category A1, however. Not uncommon are the sightings of individuals with blue skin. On the one hand there are sightings that mention a pale skin with a hint of blue, and others mention a dark blue skin colour. Note that there are also encounters which describe blue-skinned reptilians, which belong in category D.
Alex Collier mentions gold-skinned humanoids, which he claims are Lyrans. I am not aware of any witness accounts mentioning these. Some witness accounts mentions individuals who are slight of build, with long fair hair, slanted blue, green or yellow eyes, and with golden complexions. Again, these are not really cat people, but people with some - mainly facial - features that are more feline in nature: they have a mouth, nose and ears that are different from 'normal' human beings. As was the case for cat people, bird people feature prominently in Earth's mythologies. Here, too, witness accounts are scarce. Again, these are not really bird people but humanoids with features that make them appear more bird-like. Typically they have a very thin, almost frail body structure - what some would refer to as 'ectomorph.' Their face is more angular, and their eyes are more birdlike. Their hair, too, is sometimes said to be more reminiscent of feathers than of hair. There are quite a number of eyewitness reports of fairly short extrater­res­trials with a wrinkled, tanned skin. These beings, both male and female, have been met by abductees and allegedly also by whistle­blowers working for the US military. K. Wilson describes two different types of these beings: " They are both short in stature and have brown wrinkled skin, but their faces, eyes, and physiques are quite different. For example, one group has eyes shaped like ours, but they are larger. Their irises are blue and their pupils are white and shaped like a horizontal diamond-like slit. The other group of Beings with tan, wrinkled skin has eyes that are shaped similar to ours, but where we have a colored iris, their irises are black. Where we have a black pupil, their pupils are vivid blue ." The label non-humanoid mammalian is used for beings that do not look human in appearance but that do have characteristics that make them mammal-like. Most of these are also bi-pedal. Four subcategories have thus far been defined. These are three names for what is likely just one species. We seem to be dealing with the same kind of creature but in 3 different locations and with a different colour of fur depending on the location: white fur in the Himalayas, reddish brown to black fur in Northern America, and black fur in Africa. They have on some occasions been seen on board of extraterrestrial craft. 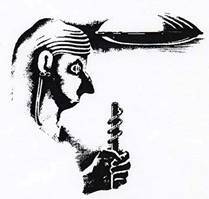 Native cultures say they are extraterrestrials. There are some accounts of dolphins being seen on UFOs, as well as of a sort of human-dolphin hybrid: humanoid shape, but with a head that is more reminiscent of dolphins. Tokoloshe is a creature that to this day is very much part of African mythology. Descriptions vary widely, though a "genuine" tokoloshe would look like a furry teddy bear with ridges on its head. Credo Mutwa says these are extraterrestrial in origin. Pier Fortunato Zanfretta is an Italian security guard who had a series of encounters between 1978 and 1980 with beings claiming to come from Teetonia. The beings are described as “enormous; no less than 10-feet [3 meter] tall,” with hairy, greenish grey skin which undulates (“as though very fat or dressed in a loose tunic”), with points on the sides of their faces, rounded fingertips, yellow triangular eyes and red veins across the forehead. Some have likened these beings to reptilians, but the fact that their skin is hairy makes a classification as non-humanoid mammalian more appropriate. The Tall Nosed Greys are 6 to 9 feet tall, and, unlike other Greys, they have a distinct nose. There are two main sources of information on Tall Greys: the late Bill Coooper, and documentary film maker Bob Emenegger. Bill Cooper says they are from Betelgeuse. In the literature they are often referred to as the Orion Tall Greys. They allegedly also have been encountered by a number of military whistleblowers in the US. For what it's worth, Michael Salla speculates these may be hybrids: human / grey. Bob Emenegger mentions tall beings with large noses as well, in the context of the Holloman landing. He would have been told this by Paul Shartle. The existing literature seems to assume these were Greys. To the best of my knowledge, however, it's at present still unclear whether these would indeed be Greys. Internet lore also mentions Orion Tall Greys as coordinating the abductions. In my experience this is incorrect: while Tall Greys feature prominently in abduction stories, none of the cases I've encountered thus far mentions these had big noses. They are 6-7 feet tall, and basically are taller versions of the ‘Standard Greys.’ They have large heads and wraparound eyes, a slit-like mouth. It is possible that we are actually dealing with two different types, because, unlike the ‘Standard Greys,’ some of these Tall Greys are said to have reproductive organs. They also seem to have something that resembles a (small) nose. 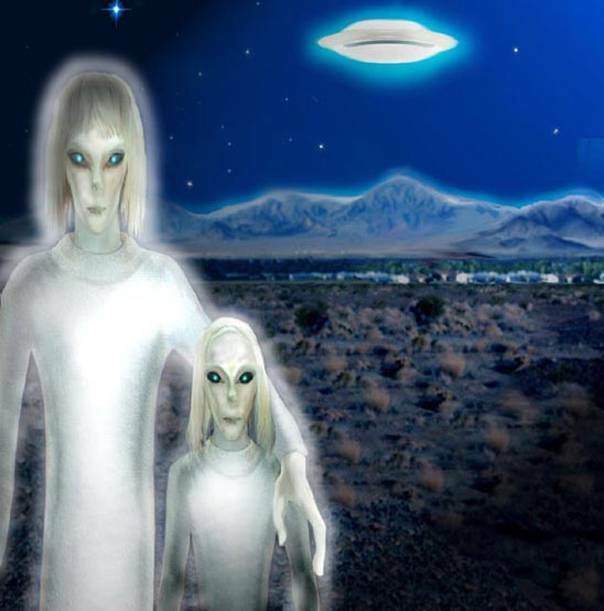 The Tall Greys have been encountered by abductees all over the world. This is the most common type. They are about four to four and a half foot tall, with large bulbous heads and wraparound eyes, a slit-like mouth, small ears without earlobes, and no visible nose. Their legs are shorter and jointed differently than one would expect in a human. Their arms often reach down to their knees. These Greys have been seen in many different colours and are generally pale in appearance: grey, white, (pale) blue, (pale) green, (pale) orange, and brown. It should be noted that there doesn't seem to be one standard phenotype of these, as they have been observed with many different features: some have hands with fingers, some have claws, some have webs, etc. It is also worthwhile mentioning that witnesses often mention Greys with cyborg features, i.e. technologically enhanced. For this reason, some people have referred to them as 'bio-robots'. Sometimes people encounter a fourth type of Grey. These Greys are shorter, about three and a half foot tall. They typically look like shorter, but far more muscular - ‘body builder’ - versions of the Standard Greys. They are said to be extremely aggressive, and generally are believed to be the most dangerous of all grey species. (On the Internet, these are often dubbed ‘Bellatrix Greys'). In recent years, I've come across a handful of reports that mention Greys that fit the description of the standard Greys (type 3), but are only two feet in size, instead of the usual four to four and half. Abduction and encounters literature all over the world mentions beings that are reptilian in appearance. In 7 % of abductions in the US, beings with reptilian features are involved. They are generally referred to as reptilian, reptoid, dinoid, or saurian. Virtually all of the ‘reptilians' mentioned below are in reality bipedal: they walk upright. So in all likelihood these beings are not really reptiles, but have characteristics that are reminiscent of reptilians. The main two exceptions to this would be a) the Ciakar, and b) the 'giant snakes', both of whom fit the description of ‘regular' reptiles. Of all the species mentioned in this list, the Ciakar and the ‘Giant Snakes' are the only two who haven't been encountered on Earth. The only source of information for the Ciakar is Alex Collier, who was told about them. So the information is based on hearsay, at best. There is royal line of the reptilian race called the Ciakar. They range from 14 to 22 feet tall and can weigh up to 1,800 pounds. They do have winged appendages and they are awesome beings. They're extremely clairvoyant and extremely clever, and they can also be extremely sinister. Reports about flying reptilians with wings originate mainly in the Americas and in Asia. These reptilians are bipedal, and have a very muscular, athletic build. They stand 7 to 8 feet tall. Their heads are typically said to be dinosaur-like (Tyrannosaurus Rex). One feature that is mentioned again and again is that they have glowing red eyes with a hypnotic stare. Just as is the case for small Greys, these beings are said to be able to fly or levitate. They have wings on their backs, but thus far there have not been any reports of these wings moving or being used, not even when they are flying. The literature often refers to these beings as Moth-men. The non-winged Draco are similar in appearance to the winged Draco but a) without wings and b) with different colours of eyes. The non-winged Draco are one of the reptilian species that are often seen on board of ships that abductees are taken to. As such, they are often seen in company of Greys. Reports of these non-winged Draco come from all over the world. They are among the most commonly encountered reptilians. The reports are contradictory, however, when it comes to the question whether these reptilians have genitalia. Some accounts mention no genitalia, while others do mention them having genitalia and engaging in sexual acts with abductees. The literature also mentions reptilians that are described as ‘iguana-like'. In appearance they are similar to the non-winged Draco but less muscular, and with a slightly different head, i.e. more resembling an iguana than a Tyrannosaurus. These reptilians are also shorter than the typical non-winged Draco, and are about 5 feet tall. In most reports, it is said that they are hooded. Personally, in South Africa, I have come across accounts of hooded reptilians with a head that is similar to an iguana, who were about 7 ft., and quite muscular. (In other words, they look like the non-winged Draco, but with a different head). A fifth category of reptilians consists of lizard men / snake men. They are about six to eight feet tall, upright, bipedal, often with lizard-like scales, greenish to brownish in colour with claw-like, four-fingered webbed hands... Their faces are said to be a cross between a human and a snake or lizard. Some are said to have a central ridge coming down from the top of the head to the snout. 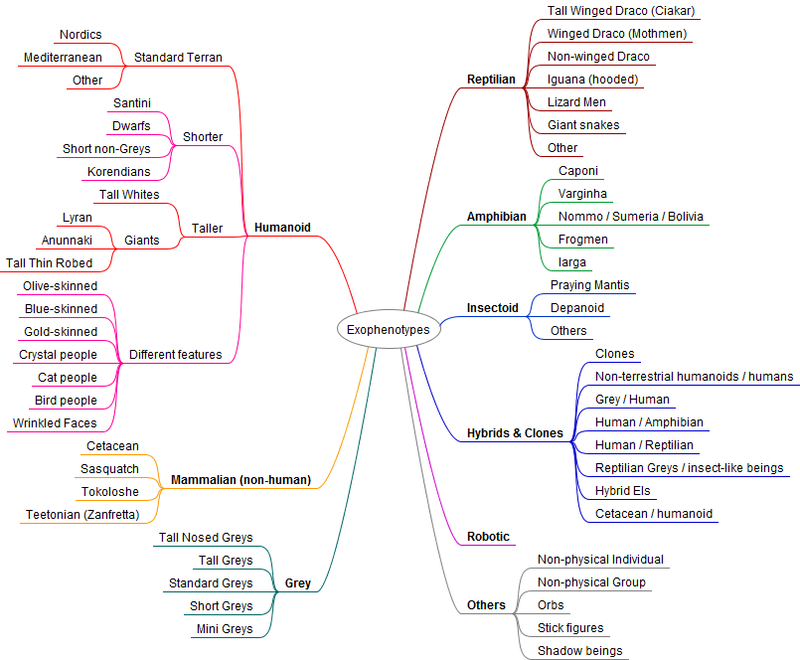 Some of the reptilians who are seen in the company of Greys fit these descriptions. Again, reports are contradictory as to whether they have genitalia. The majority of accounts I've come across, however, seem to indicate that genitalia are present. Since some witnesses refer to a 'snake-like' head, while others use 'lizard-like' it is possible that these are separate groups. Given the different accounts with regard to skin and genitalia, it is possible that we are actually dealing with several different groups. There are a number of reports on the Internet that mention gigantic snakes of extraterrestrial origin. These would be genuine reptiles: not bi-pedal, not even legged. Thus far, however, I haven't come across any reliable sources. 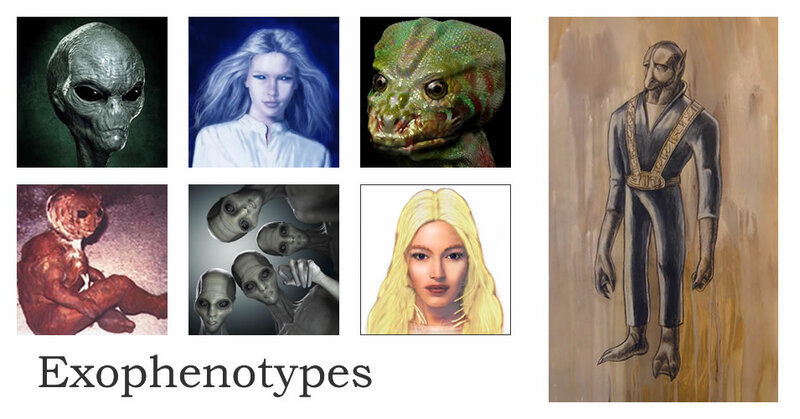 Apart from the phenotypes mentioned above, abductees have also described encounters with reptilian looking beings that do not fall in the categories listed above. Some of them seem to be variations on the other phenotypes. E.g., there are accounts of beings that fit the description of the lizard men but they seem to have a wet leathery skin and have hands with fingers instead of claws. Further research is definitely needed. These were seen on several occasions by Filiberto Caponi, in Pretare d'Arquata del Tronto, Italy, in 1993. He was able to take a number of photographs of them, like the one displayed on the right. The beings are short, about 80 cm tall, with a wet/oily glistering brown reticulated skin, and black eyes. Other accounts refer to these beings as Ginger-bread men. Similar encounters (to the Caponi case) happened in Varginha Brazil in 1996. The beings here were said to have "oily/shiny (wet?) brown skin", "large round head, small neck, large red eyes, no hair at all", "very small hands with three long fingers," "huge veins running down its neck, like a giant ox heart." An important difference with the Caponi case, however, is that these beings are said to have ridges on their skull. Witnesses claim the beings were looking for water. The Dogon tribe in Mali mention that they have been in contact with an amphibian race of extraterrestrials that allegedly come from Sirius. They refer to these beings as the Nommo, and describe them as half human and half fish. There is a strong similarity with the Babylonian water god Oannes who was also said to be half man, half fish. Statues of Oannes-like beings have also been found in Tiahuanaco, Bolivia and in Nevali Çori in Anatolia, Turkey. There are reports of encounters with 'frog men.' These have a humanoid body structure, are bipedal but have a head like the one of a frog. They are fairly short, 4 to 5 ft. (1.2 - 1.5 meter). Wendelle Stevens and Stefan Denaerde (a pseudonym) mention an amphibian species with humanoid traits, from the planet Iarga. The inhabitants of Iarga are said to have a humanoid body structure, and are bipedal. The main differences are a distinctly different head structure. They have very muscular, and longer arms, clawed fingers with webs in between them. "The Iargans stand approximately five feet tall. They were originally amphibians. They have webs between their fingers and toes. Compared to us, what stands out are their longer arms, the rubbery muscle formations, and the armored skulls. " As was the case with the Reptilians and Amphibians, the Insectoids are a mixed category where some of the phenotypes display some humanoid traits as well, whereas others are more akin to what is normally considered an insect. The insectoids that are the most common are beings that are reminiscent of praying mantises. They are encountered quite often during abduction experiences. Most accounts describe them as approximately 6 foot / 1.8 m tall. The majority of reports list them as bipedal, though there are others that describe them as more insect-like. The possibility cannot be dismissed that the bipedal ones could be hybrids. There are reports of beings that are bipedal, with a humanoid torso and limbs, but with an oversized ‘bug' head. These, too, have been encountered by a handful of abductees. The name ‘depanoid' was given by one of those abductees, Jim R.
The beings are described as ‘energy-suckers.' They put their victims through experiences that the victims respond highly emotionally to, and then they ‘feed' of those emotions. During abductions other insect-like beings have been encountered that don't fall in the two aforementioned subcategories. From this point onward most of the text still needs to be written out! Many of these are probably artificially created, though it is clear that species some can interbreed. This seems to be the case for human-looking extraterrestrials that look like us (A1) and terrestrial humans. Also: in some occasions MIB are described as identical clones. Greys created (cloned) by humans, and under human control. David Jacobs distinguishes 4 different types, depending on how ‘Grey’ or ‘human’ they look: “I have arbitrarily divided these hybrids into early-stage, middle-stage, late-stage, and human-stage hybrids. The early-stage ones look quite alien, although they have some hair, they are very thin, and they have large black eyes with a little bit of white corneas in the eyes. They have very thin, wispy hair and oddly shaped faces with pointed chins. Their bodies are thin as well. They are seldom seen outside the confines of a UFO, in which they do tasks required of them to help out with the abduction program. The middle-stage hybrids look more human. They have large black eyes with more white showing. They have thin, but more, hair. They have bodies that are not so thin. They also help with abduction procedures. The late-stage hybrids are attached to abductees as personal friends and help the abductees to learn to work projects for “the future.” They are seen in public and can often pass for human. 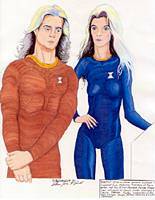 They live onboard the UFOs and make forays into normal human life as part of the abduction program. They do not have a life here among us. The human-stage hybrids mainly deal with abductees in their normal human environ-ment. They are, on the surface, indistinguishable from humans. They have different biological and neurological processes than humans that give them special abilities, such as being able to control humans." Beings with the body structure of a human, but with a dolphin head. Possible alternative classification as Amphibian. Robots and ‘cyborg’ style : cybernetically enhanced. [Note: cybernetic = adj., adverb however is cybernetically]. Some of these are labelled 'non-physical.' It should be noted, however, that non-physical shouldn't be taken too literally. Not physical as we experience physical 3d material reality. (Cf. the terminology of 'subtle' bodies that is sometimes used. Some authors refer to these non-physical beings as 'etheric' or 'astral' while others use terms as other-dimensional, ultra-dimensional, or higher dimensional). The Exopaedia keeps a list of the different extraterrestrial species and civilizations that people have encountered, here on Earth. Over 120 different species and civilizations have been encountered thus far. The descriptions that these witnesses have given were used to categorize the different phenotypes. The table below lists how many different civilizations match a specific category of phenotypes. 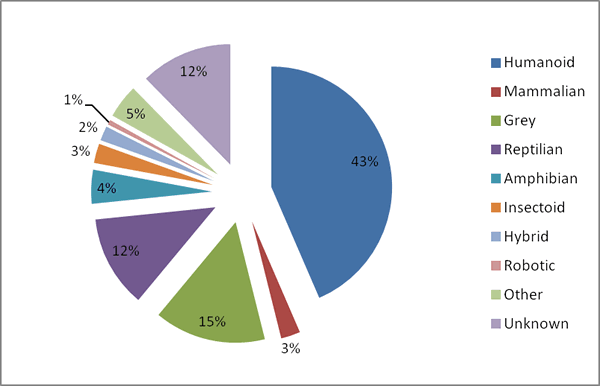 So the way to read this table is as follows: out of 120+ different civilizations we've encountered here on Earth, 67 (or 43%) were humanoid, 4 (3%) were non-humanoid mammalian, 23 (15%) were greys, 19 (12%) were reptilian, etc. The table and chart do NOT represent the frequency of encounters with beings that belong to a certain category! Greys, e.g., make up 15% of the different species / civilizations that have been encountered, but are encountered in up to 73% of the abduction cases in the US.